What is a Balloon Sinuplasty Center of Excellence? The doctors at the ENT Institute are leaders in the country for Balloon Sinuplasty. In fact, The ENT Institute is a Center of Excellence for best practices in performing in office Balloon Sinuplasty. Being a Balloon Sinuplasty Center of Excellence means that doctors from across the country come to the ENT Institute to learn how to perform in office Balloon Sinuplasty from our doctors. We’ve even had doctors from as far away as California and New York come to train under our doctors regularly. 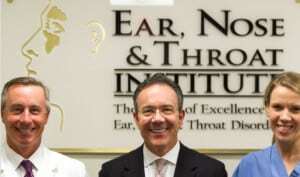 The ENT Institute has set the standard nationwide for others to follow. The ENT Institute is even planning to take the ‘Center of excellence’ (as if that was not impressive enough) a step further. So that doctors can get the most from our practice, we are planning to so live streaming sessions of some of the procedures. This way, we can teach even more doctors the correct and expert procedural practices and techniques that we pride ourselves on. So, what is a Balloon Sinuplasty? Well, it is a procedure that cures sinus issues without invasive sinus drilling or regiments of medicines. A tiny balloon is dilated inside the sinus cavities to expand them, thus fixing the sinus problems for just as long as the surgical option. A Balloon Sinuplasty can also be performed in your doctor’s office without the need for cutting or tissue removal. Dr. Jeff Gallups, Founder and Medical Director of the ENT Institute, recruits top doctors from across the county to join our practice and only selects the most highly skilled physicians to join our exceptional team. When you trust your care to our doctors, rest assured that you have the best of the best in the country, and the team that other doctors look to for training and advice. Why trust your health to anyone else?